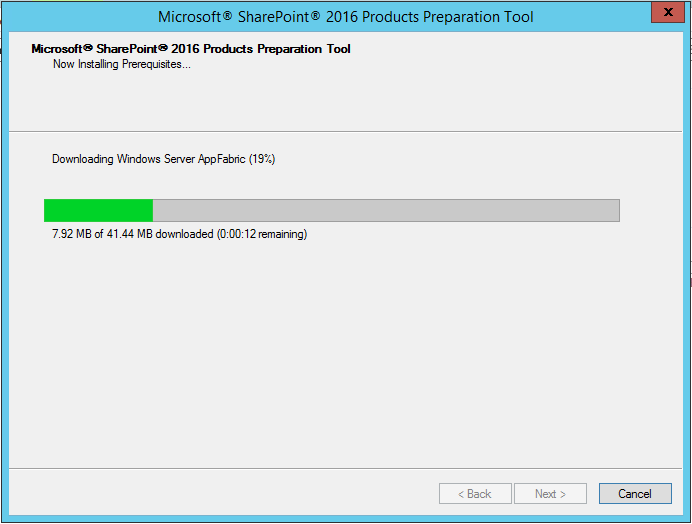 Let’s say you have a fresh Windows Server 2012 R2 machine and you start to install SharePoint 2016 IT Preview. 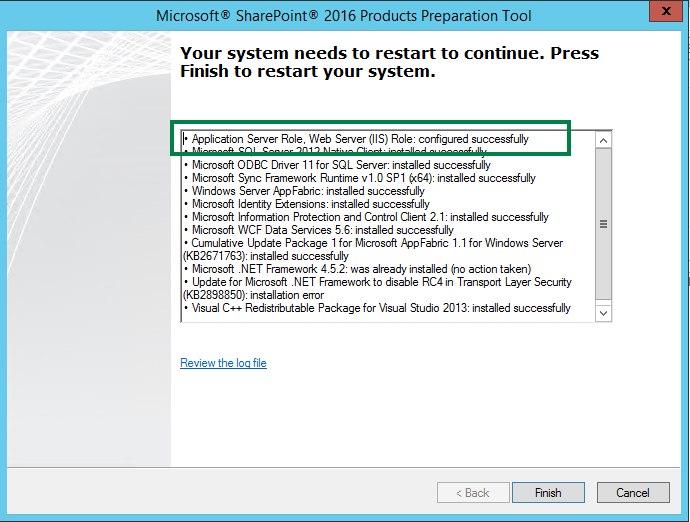 If the Microsoft SharePoint Products Preparation Tool execution will fail at the Application Server Role, Web Server (IIS) Role step, most likely this is happening due to the fact you are missing the Side-by-Side folder required to install features like ASP.NET 4.5. The log file is actually providing some hints about where the problem is. Installing windows server roles and features. 2015-08-27 00:03:43 - "C:\Windows\system32\WindowsPowerShell\v1.0\powershell.exe" -ExecutionPolicy Bypass "C:\Users\SRV_SP~1\AppData\Local\Temp\PreA1FB.tmp.PS1 -logFile C:\Users\SRV_SP~1\AppData\Local\Temp\PreA1FB.tmp.PS1.log"
2015-08-27 00:04:00 - Error: The tool was unable to install Application Server Role, Web Server (IIS) Role. 2015-08-27 00:04:00 - Options for further diagnostics: 1. Look up the return code value 2. Download the prerequisite manually and verify size downloaded by the prerequisite installer. 3. 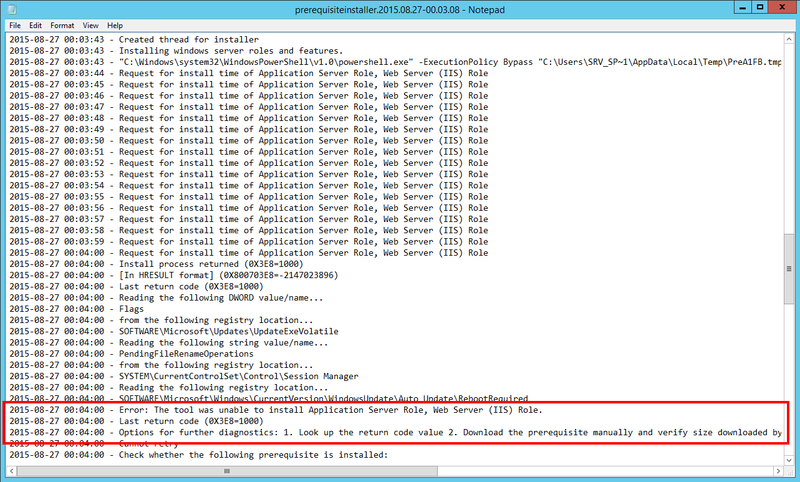 Install the prerequisite manually from the given location without any command line options. If we look into what does Application Server Role, Web Server (IIS) Role step means, we will see a PowerShell script who does, well … application server and web server role installation. If you will try separately to execute the PowerShell script, then the solution to the problem is revealed. My playground environment has GPO’s with Specify settings for optional component installation and component repair defined, but this time I decided to isolate the SharePoint 2016 installation from my playground and I encountered the OOB “experience”. I still recommend to go with solution no. 1 (simply because it will apply to all the other servers and is a solid one), but in case you are in an isolated network, or simply just want to move on with the SP2016 setup, then I recommend to execute the following command before re-running the preparation tool. 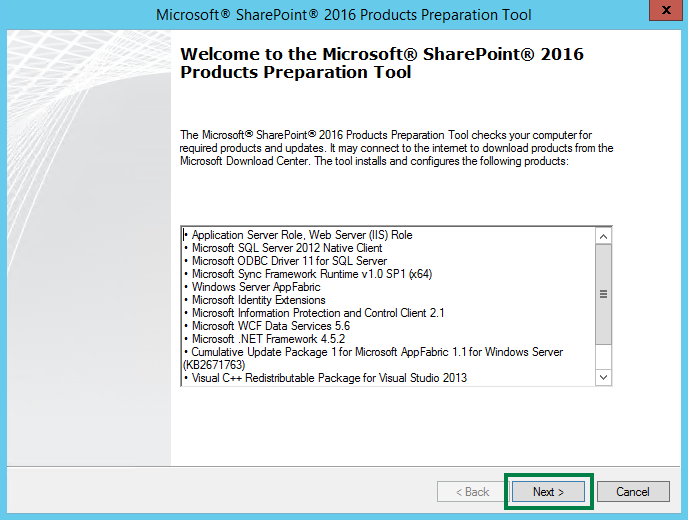 Re-run the SharePoint 2016 Products Preparation Tool and go further. And if you already started to test SharePoint 2016, here are listed couple of known issues. ‘Application-Server,AS-Web-Support’. The name was not found. And striving through the available features with Get-WindowsFeature seem to confirm this. Which preview were you running? Any idea what I might have missed? Solution 2 worked like a charm. Thank you very much. Thank you very much for this solution. We’re setting up a Test environment with the current RC and it’s still a problem which I find disappointing. It doesn’t inspire confidence when the prerequisite install can’t even run. I went with the quickness of Solution 2 and it worked perfectly. Great write up! This allowed the pre-requisites and SharePoint to install. Solution2 worked for me. Perfect ! It got me past the error, thanks. However, now the prerequisite installer is in an endless loop trying to install App Fabric over and over again. 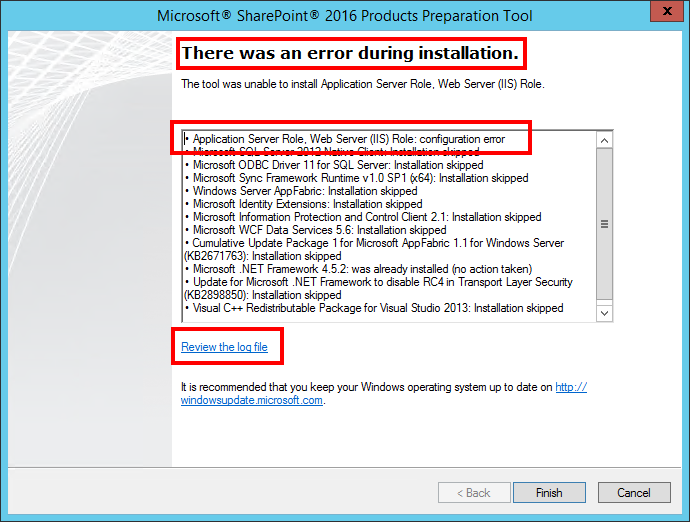 Your SharePoint installation error description and concise solution (and two solution choices, no less!) helped me out tremendously. Kudos for your nice and clear instructions AND accompanying screen prints. I used Solution #2 as I don’t have access to group policies at my company. 2nd option worked form e too… thanks a lot man….. Thank you guys! this works like charm! Can’t believe that Microsoft has this issues since SharePoint 2013… Microsoft doesn’t seem to fix it and use public as their QA team. Very Bad!